The Library has its main Assistive Technology Area on floor 1. This area can be used by any student, but is primarily for staff and students registered with Disability Services. Please see the notices at each computer for details of which packages are loaded. Please note: other students are expected to move to another study space if somebody registered with Disability Services requests to use the equipment. The desks do have priority stickers but if you are uncomfortable approaching other students, staff will intervene on your behalf. 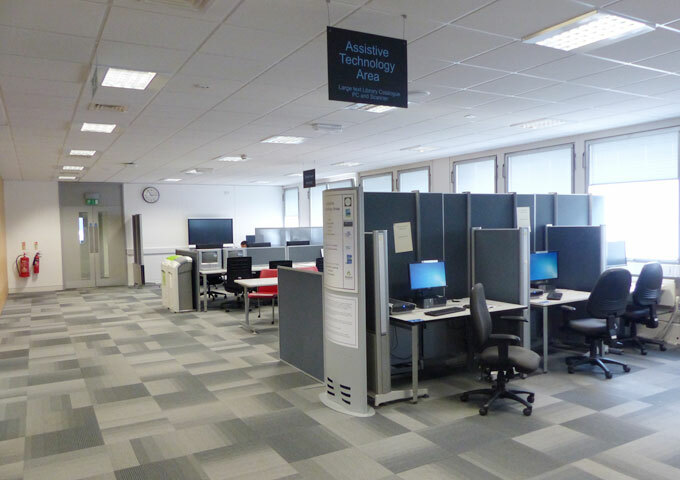 All Accessible Study Rooms also have assistive technology/assistive-software which may only be used by students registered with Disability Services..
Book and view assistive-software available in individual rooms.